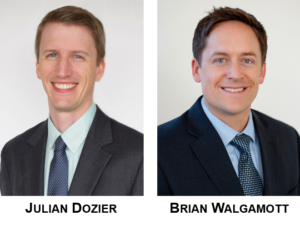 THF announces that Julian Dozier and Brian Walgamott have been admitted as shareholders and will join the eight other shareholders as owners of the company. A graduate of Leadership Tallahassee Class 32, Julian Dozier has been providing assurance, consulting, and other accounting services since 2006. He has a special interest in for-profit entities with specialized engagements that include forensic and financial statement audits and litigation support. His special designations include being a Certified Fraud Examiner, Certified in Financial Forensics, and Accredited in Business Valuation. Julian is a board member of Leadership Tallahassee, the Tallahassee Symphony Orchestra, and the Florida Institute of Certified Public Accountants. He has won numerous local and national awards including the National Association of Consulting Valuators and Analysts’ “40 Under 40” and the American Institute of Certified Public Accountants Forensic and Valuation Services Division’s “Standing Ovation” award. Through all of this, he believes his most important title is “Dad” thanks to his inquisitive, compassionate, and adventurous young daughter. A graduate of Leadership Tallahassee Class 35, Brian Walgamott has been providing tax, consulting, and outsourced CFO services since 2008. His current clients served include corporations, partnerships, trusts, and high net worth individuals. He has a special interest in the medical, professional service, and technology industries. Brian is the current treasurer of Big Brothers Big Sisters of the Big Bend and recently received the “Top 40 Under 40” award for the national publication, CPA Practice Advisor. In his spare time, he stays busy keeping up with his wife, Nicole, and their son and daughter and their busy activities through sports and Scouts. Congratulations Julian and Brian on being admitted to the shareholder group!